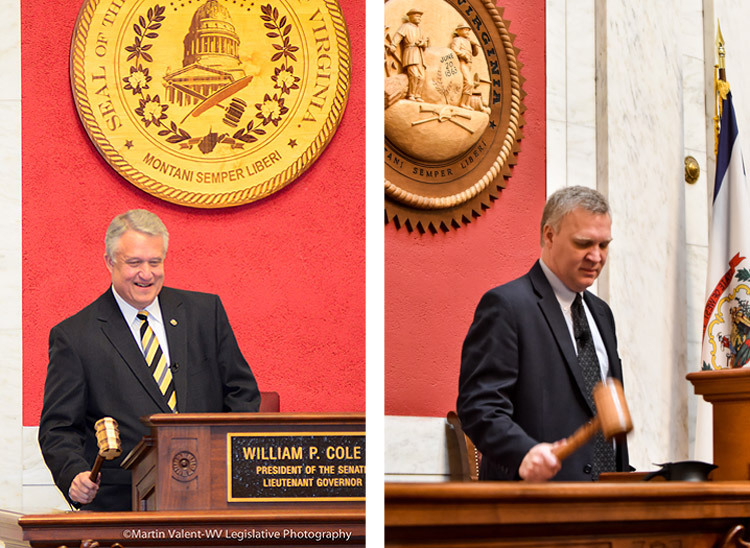 For the first time since 1931, Republicans took full control of the legislative branch of government in the state when members gaveled in on Jan. 14 to begin the business of the First Regular Session of the 82nd West Virginia Legislature. The Senate is led by new President Bill Cole (R-Mercer, 6th District) and Majority Leader Mitch Carmichael (R-Jackson, 4th District). New Speaker Tim Armstead (R-Kanawha, 40th District) and Majority Leader Daryl Cowles (R-Morgan, 58th District) comprise the top of the new leadership team in the House of Delegates. The Republicans have set up an aggressive agenda for the session that includes tort reform, education reform and government audits to determine where government waste can be eliminated. The Legislature completed legislative action on its first bill of the session with the passage of House Bill 2001 on Jan. 28. The legislation repeals sections of the Alternative and Renewable Energy Portfolio Act but leaves in language that creates net metering for customer generators, which gives credits to customers with solar or wind power systems that generate electricity for the power grid. The original law passed in 2009 required power companies in the state to use fuels other than coal for a portion of their electricity production a decade from now. The law required power plants to reach thresholds for using alternative fuels, ultimately to account for 25 percent of electricity generated by 2025. Cole believes that repealing this law will help the coal industry and keep utility rates low for state residents as alternative fuels are currently more costly than coal. Armstead was pleased that the Legislature acted swiftly to complete action on a bill that is expected to help the coal industry. “Today’s passage of this legislation will free our state’s utility industry from a flawed regulatory scheme, help reduce the threat of electricity rate increases and provide greater opportunities for our hardworking coal miners,” Armstead said. Senate Bill 3 would prevent owner, lessee, or other lawful occupant of real property from owing a trespasser care for injury or harm done. Also it would allow said possessor to use justifiable force to remove a criminal trespasser. It establishes that the new section does not increase the liability of any possessor and does not affect any protections from liability established by another section of the code. Senate Bill 12 would require payment of outstanding wages to be done by the next regular payday with exceptions. The exceptions being fringe benefits and bonuses are not covered. The bill also reduces the amount of liquidated damages available and provides an instance where they are not available. The bill would authorize payments by mail if requested by the employee too. Senate Bill 43 would limit tolling of statute of limitations with regards to claims brought by a defendant against any person not originally involved in the civil action to be filed within 180 days from the date of process of the original complaint; provided that any new party brought into litigation also has 180 days tolling got the statute of limitations. Senate Bill 59 would require any vehicle involved in a crash resulting in injury or death to stop immediately and remain at the scene of until the driver complies with the requirements of this proposed law. The person would be able to leave the crash in order to render assistance to an injured person. This bill would find that any person convicted of knowingly leaving the scene after a crash resulting in death guilty of a felony and be fined no more than $5,000 or imprisoned for no less than one year and no more than five years or both. Any conviction for leaving the scene of a crash resulting in bodily injury would be fined no more than $2,500 or imprisoned no less than one year nor more than three years or both. House Bill 2046 relates to the treatment for sexually transmitted diseases. It would allow a healthcare professional to prescribe an antibiotic for the sexual partner or partners of a patient they are treating for a sexually transmitted disease without first having to conduct an examination of the partner or partners in cases where the patient presents with a sexually transmitted disease. House Bill 2008 relates to auditing the Division of Highways. The bill would require the Joint Committee on Government and Finance to order a performance audit of the Division of Highways by each individual district by May 1, 2015. The performance audit would cover the preceding three fiscal years and a final report would be submitted to the Joint Committee on Government and Finance with a copy to the Governor on or before December 31, 2015. The bill would also require that the firm selected to do the audit be chosen through a competitive bid based upon price and qualifications. The principal may not be currently auditing any agency of the State of West Virginia and may not have audited any state agency for the five years preceding the submission of the bids. House Bill 2015 would require the Legislative Auditor to conduct performance reviews and audits for every government spending unit, including all members of the Board of Public Works and the Legislature. The bill would eliminate the current seven year schedule and replace it with a four year schedule. It would also add seven agencies to the current list of agencies to be reviewed. The new agencies would include: Office of the Governor, Secretary of State’s Office, State Auditor’s Office, State Treasurer’s Office, Attorney General’s Office, the Senate, and the House of Delegates. House Bill 2028 relates generally to purchasing. The bill would prohibit the award of or the renewal of state contracts over $2 million to vendors owned, in whole or part, by state officials or by family members of state officials. The bill would define state official, family member of state official, state office and vendor. The bill would also require an affidavit of compliance to accompany bids, contract proposals and contracts with the state. The bill also provides that, upon request, the Ethics Commission may review and approve exceptions to this prohibition. House Bill 2103 relates generally to boards of examination and registration and would require every chapter 30 board to provide public access through a website regarding the disposition of complaints. If the board is unable to pay for this service, the Attorney General would provide a link to this information and a link to all boards subject to Chapter 30 on the Consumer Protection Division website. The bill also would require the West Virginia Board of Medicine, the West Virginia Board of Dentistry, the West Virginia Board of Pharmacy, the West Virginia State Board of Examiners for Licensed Practical Nurses, the West Virginia Board of Osteopathy, the West Virginia Board of Examiners for Registered Professional Nurses, the State Board of Examiners of Psychologists, and the West Virginia Board of Accountancy to order a criminal background check. House Bill 2002 would predicate the actions for damages upon principles of comparative fault and establishes the comparative fault standard. The bill also would establish how to consider the fault of non-parties as well as how to consider the fault of, and the amounts paid by, settling parties. House Bill 2025 would add an additional restriction upon certain convicted sexual offenders during a period of supervised release. Specifically, individuals deemed sexually violent offenders or who have been convicted of certain sexual offenses would be prohibited from loitering within a 1,000 feet of a school, child care facility, or residence of a victim. House Bill 2201 would require the Public Service Commission to adopt certain net metering and interconnection rules and standards. It would require they adopt a rule requiring that all electric utilities provide a rebate or discount at fair value, to be determined by the commission, to customer-generators for any electricity generation that is delivered to the utility under a net metering arrangement; to, further, consider adopting, by rule, a requirement that all sellers of electricity offer net metering rebates or discounts to customer-generators, and to institute a general investigation for the purpose of adopting rules pertaining to net metering. Senate President William P. Cole III and House Speaker Tim Armstead gavel in for the first time.